It is impossible to imagine Sarajevo without Bascarsia, whose name literally means “main market”. It is the center of the city, or even a city within the city. Built in the fifteenth century, the market or bazaar was originally limited to the square around the public drinking fountain called the Sebilj, before expanding into the surrounding streets. Bascarsija is a place where you can while away hours and hours and here the expression “time flies when you’re having fun” is literally true. So of course we went back there every day. Naturally we had to try some real Bosnian cevapcici with kajmak and get our teeth into one of the many types of burek , which really have no equal. And of course we had to drink real Sarajevo-style Turkish coffee, served on a traditional long-handled copper coffee pot, and enjoy some delicious sweet baklava. Each day we sat in one of the cafes in one of the little streets and watched the passers-by, and visited some of the many little shops, souvenir stalls and workshops. If for no other reason than simply to satisfy our curiosity. 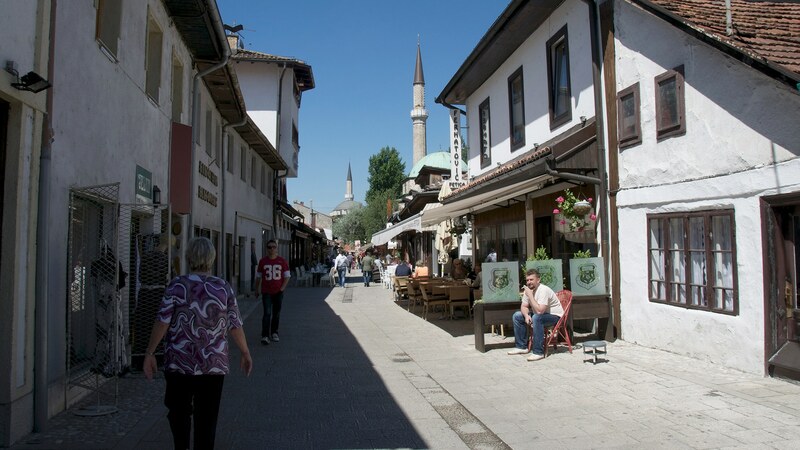 We were staying not far from Bascarsija but to get there each day we have to walk down Ferhadija, Sarajevo main shopping and walking street. To make it a little easier for our budding traveler to get around the city, and reduce the time it took us to walk one point to another, we sent him out into the street on his pedal-less balance bike. As he skillfully wove his way in and out of crowds of pedestrians, he becomes one of the biggest attractions on Ferhadija, blending in perfectly with the mosaic of people who make up Sarajevo. Sarajevo is a colorful multicultural city in which we immediately felt welcome, almost of though we lived there. People were friendly to us, the family in whose flat we were staying immediately adopted us as their own, while out on the street we could stop anyone and they would always answer our questions good-humouredly. 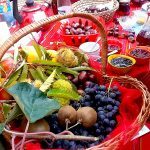 You can also can make new friends by offering tips or suggesting moves when watching a game of chess on the enormous chessboard not far from Ulica Marsala Tita (Marshall Tito Street), something we experience for ourselves. 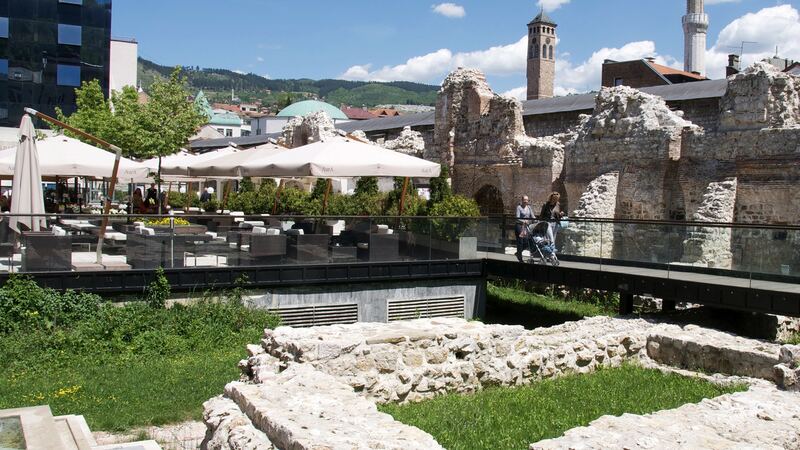 Sarajevo is famous in history as the city in which Gavrilo Princip assassinated Archduke Franz Ferdinand, the heir to the Austro-Hungarian throne, in 1914, thereby triggering the First World War. The Latin Bridge, where the assassination took place, is actually only one of many bridges linking the two banks of the river Miljacka; but of course this is a bridge that we simply had to cross, because of its historical importance. There is no major memorial or plaque commemorating the event on the bridge itself (although the Gavrilo Princip Museum is located in a building next to the bridge), but on the spot where Princip once stood we find his modern-day successors – selling a range of souvenirs and commemorative tea towels. 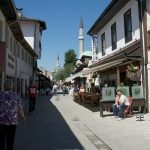 Another interesting fact about Sarajevo is that it is the only city on Europe where in the space of just a few hundred meters you can find a mosque, a Catholic church, and Orthodox Church and a synagogue. We decided to visit the Gazi Husrev-beg Mosque, which owing to its size and attractiveness is one of the most interesting monuments of Islamic architecture in the Balkans. Visiting a Mosque with a three-year-old child is something of undertaking, since there is a lot to be curious about and is difficult to keep quiet and listen to a strange man explaining something to your parents in a foreign language. There is no doubt, though that a visit to a Beg’s Mosque is worth having to answer countless questions from an inquisitive child who is getting his lesson about the religions of the world. When visiting Sarajevo it is impossible to miss the consequences of the recent war in Bosnia and Herzegovina. On our trip we visited the “Tunnel of Hope”, built beneath the runway of Sarajevo Airport in 1933. As we learned from one of the locals whom we met outside the tunnel museum, it was also known as the “tunnel that wasn’t there”. During the siege of Sarajevo it served as a vital lifeline, allowing food, medicines, weapons, newspapers, fuel and other goods to be brought in, and through which many people were able to leave the city in safety. The house of the Kolar family, where the tunnel began, is now a museum dedicated to that period, although only slightly over 20 meters of the tunnel have been preserved. Not much, but enough to remind us that something like this must never be allowed to happen again; for children, of course, it is too little, because walking along the underground railway lines is a great fun. With population of approximately 550,000, Sarajevo is not a big city. You can cover it all on foot in a single day, but you can also hop on a tram or a two and visit Ilidza or Vrelo Bosne (the spring of the river Bosna). It is an incredibly lively and interesting city, where you are never bored. It is a place where you can really sence the coexistence of the different cultures that give the city is character. But our strongest memory from Sarajevo is of the wonderful people we had the opportunity to get to know.